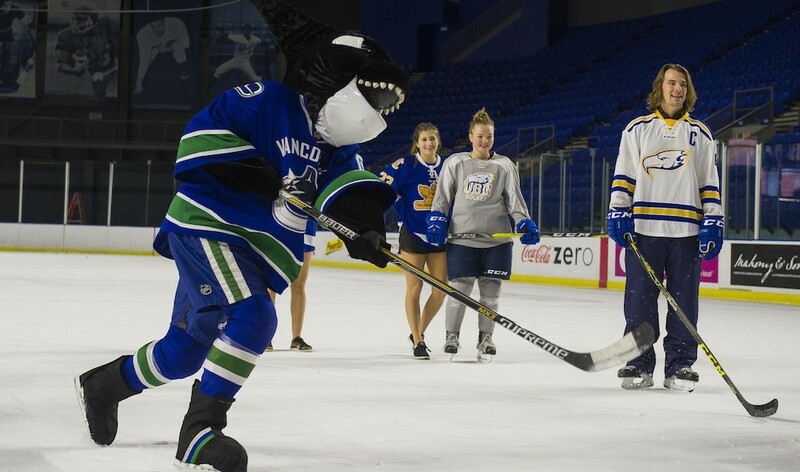 This Saturday at 11 am, fans are invited to watch the Vancouver Canucks at the Doug Mitchell Tunderbird Arena at UBC, where the team will be holding an open practice. The event is a fundraiser for the UBC Thunderbirds Hockey Scholarship Fund, with tickets costing $47.25, or $36.75 for students. Tickets to the event are redeemable for a future Canucks home game (see below for eligible games). “The quality of men’s and women’s hockey at the university level is so impressive,” said Canucks head coach Willie Desjardins. “I’ve coached varsity hockey in Canada and some of my most memorable hockey experiences came at the CIAU level. I also know it offers students a chance to be healthier and well-rounded people because they’re able to pursue their ambitions in both academics and hockey. Following practice, select Canucks players will hold a shootout competition with members of the UBC men’s and women’s hockey programs. Perhaps we’ll see Matt Hewitt in action again?